I’ve got a bit of a backlog of sewing projects to share – last year before our trip to Japan I churned out a pair of Ginger jeans for me, another pair of Jutland pants for Luke and a merino Ensis tee for me, thus proving to me once and for all that I work best with a deadline in sight! 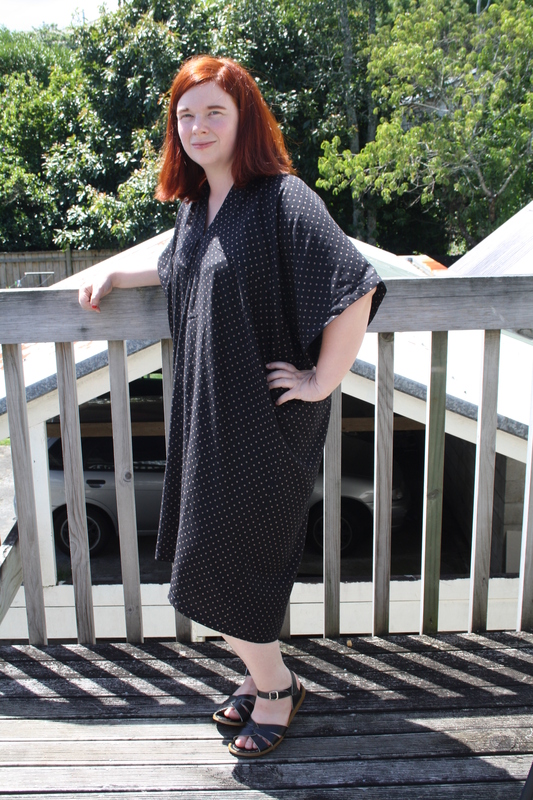 But since it’s summer here in NZ and I’m not currently wearing jeans or merino tops, here’s a project I sewed up today instead. The pattern is one I bought from Miss Matatabi last year, on a whim. 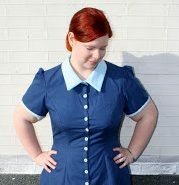 I hadn’t heard of the pattern company before, but it was cheap and something about it intrigued me. It seems right now she’s only stocking the blouse in a kit, however. It consists of 3 pieces – the front and back are identical, and then the sleeves/yoke are a separate piece for front and back. 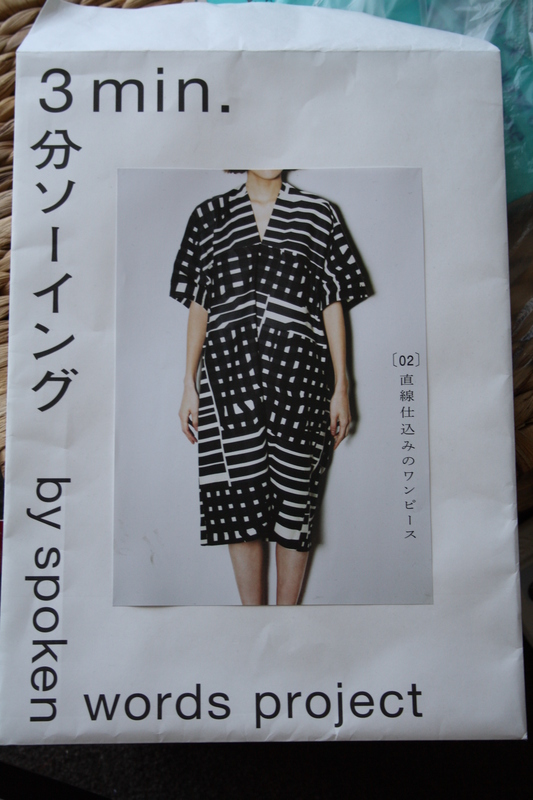 The pattern is entirely in Japanese, however there are diagrams to help. I have been teaching myself Japanese for a while now (and previously studied it for a year at University) and so my prior knowledge together with Google Translate helped me to understand most of what was going on. Unfortunately I’m never very good at visualising how to rotate pattern pieces and how everything comes together in English patterns, let alone Japanese ones, so there was definitely some head scratching at first. The end result is…well, it’s different. Japanese fashion always looks effortless and elegant on Japanese people, but on me? Not so much. I’ve wanted to give Japanese sewing patterns a go for a while, and I own a couple of books, but up until quite recently I’ve been larger than the largest size, and I can’t be arsed grading up. This particular pattern is one size, but that size is huge so no worries there. I haven’t altered it at all. I’m carrying some extra kilos from eating ALL THE CAKES in Japan, but hey, I could be 6 months pregnant under this dress and no one would be any the wiser. It’s a very simple silhouette – a bit kimono-esque. The sleeve/yoke pieces are joined together to make the entire top of the dress, there is no shoulder seam, and they’re just rectangles. The first front seam hits across my high bust, the second somewhere across my upper back/shoulders, and the third around my armpits. The inside is very neat, everything is overlocked, turned and stitched in place. And, in a minor miracle for me, all the notches and hems lined up everywhere. Seriously, this never happens! 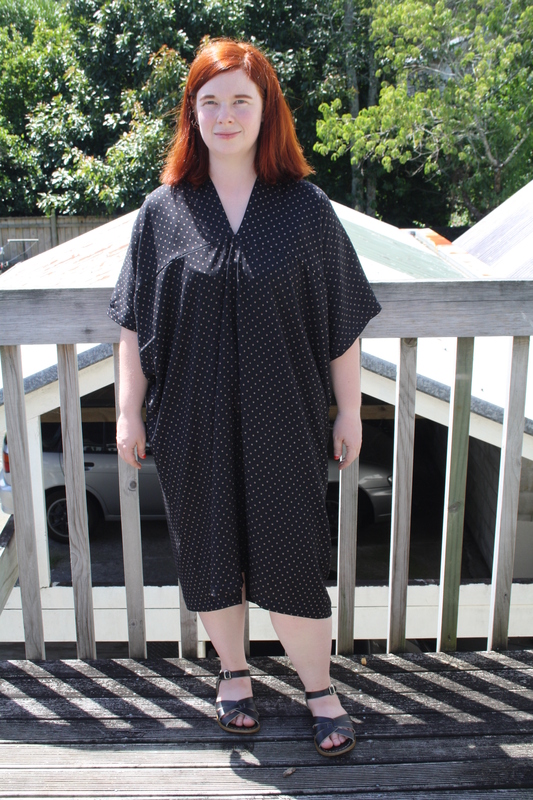 The fabric is a rayon challis (most likely) bought from a fabric bin at my local Red Cross op shop. 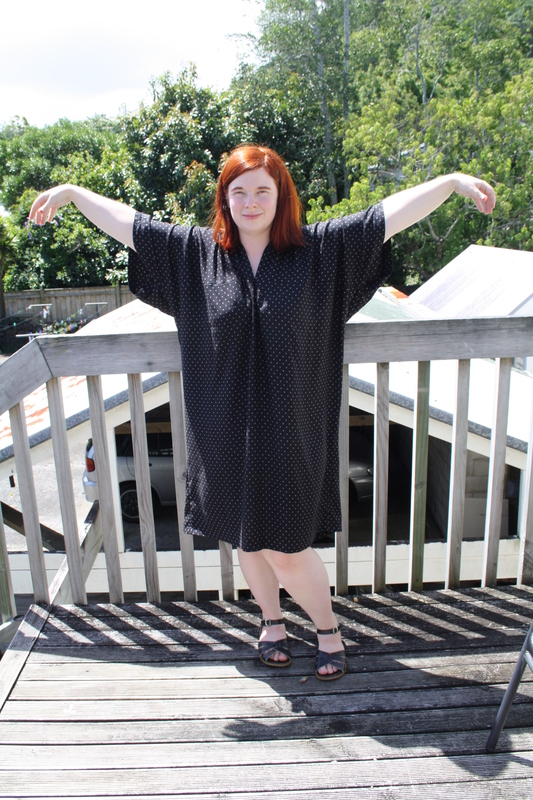 It’s got fantastic drape, and is light and flowy – perfect for the sudden onset of warm weather Auckland is having. All that said, I’m a bit on the fence about it. I mean, it’s not flattering. At all. But it is supremely comfortable, and I feel weirdly stylish wearing it. I ventured out to my local dairy (convenience store) this afternoon in it and felt a bit confident, even. 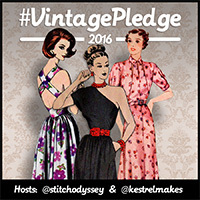 I don’t think I’ll make it again though – for starters, I think 1 muumuu in my wardrobe is enough, and I have a list of things I want to sew that just keeps growing, so no time for repeats! 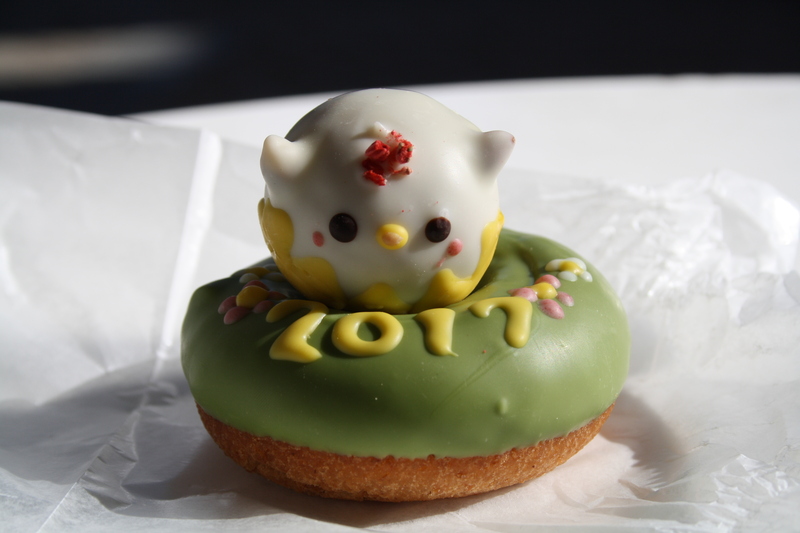 Just one of the delicious treats I ate in Japan – already wondering when I can return!